Ted is an excellent observer and ornithologist! He worked in the fall of 2016 at Veracruz, Mexico, which is host to the greatest raptor migration spectacle in the world. More than 25 species of migrating raptors are recorded each autumn, with counts reaching more than 100,000 migrant raptors and vultures per day during the peak of the flight. An additional 10 million daytime passerine and water birds migrate as well. He reported that his best count day in Mexico was when he recorded over 200,000 raptors and vultures. Almost 4 million raptors and vultures were counted throughout that fall. Last spring, Ted also helped count around 500,000 raptors in Israel at a migration site that holds the record for the largest spring migration. Late the next afternoon, Sue looking west out of the kitchen window watched two Canada geese as they flew over the yard heading east toward the pond. Suddenly, a golden eagle approached them from the north and broke up the pair in mid-air. “The whole scene reminded me that these large eagles have to be on the hunt at all times, looking for the opportunity to make a kill”. The large raptor did not circle back in pursuit of the geese, rather it left the scene and the geese made a bee-line for the safely of Goose Pond. 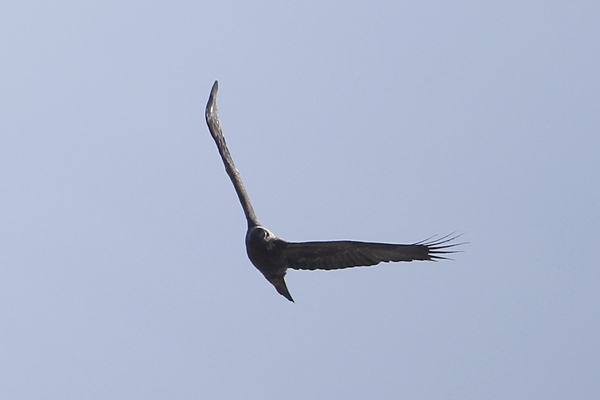 Sam Robbins in 1991 wrote in Wisconsin Birdlife that golden eagles are “rare spring migrants”. From 1960 to 1990 he was able to locate only one record in late fall of a golden eagle in Columbia County. Robbins also reported a nesting pair of golden eagles from Ferry Bluff in Sauk County around 1905 to 1907. In 1908 the pair was shot by a local farmer. 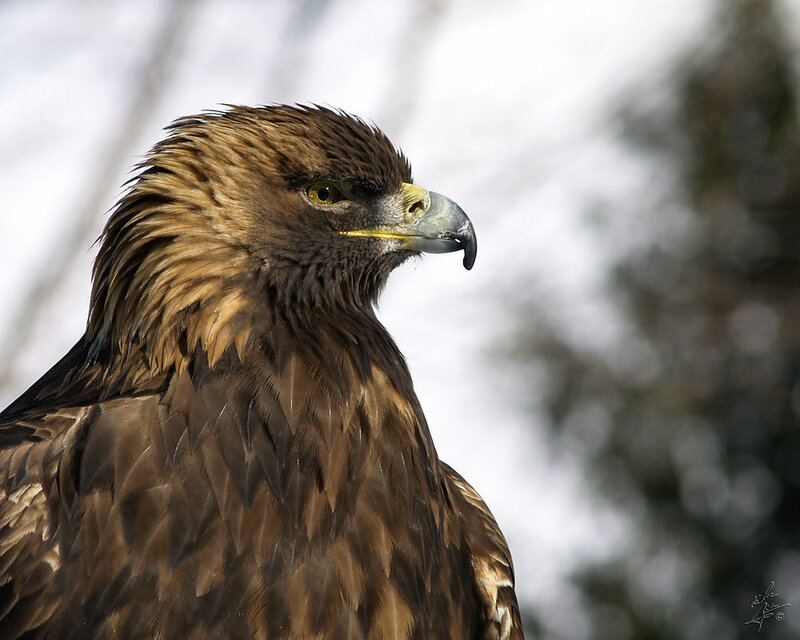 Golden eagles with a seven-foot wingspan are the largest raptor in North American. They are the most widely distributed eagle, being found throughout the Northern hemisphere and are also found in the old world from Finland to Japan. They are incredible hunters and are able to spot prey over two miles away, make dives after prey between 150 to 200 miles per hour, and can squeeze their talon with a force of between 400 to 750 pounds per square inch. They hunt a wide variety of prey including jack rabbits, badgers, cranes, and swans. Many people have watched the YouTube videos of a golden eagle knocking a mountain goat off a cliff, or a father and son with their golden eagle hunting fox in Mongolia. 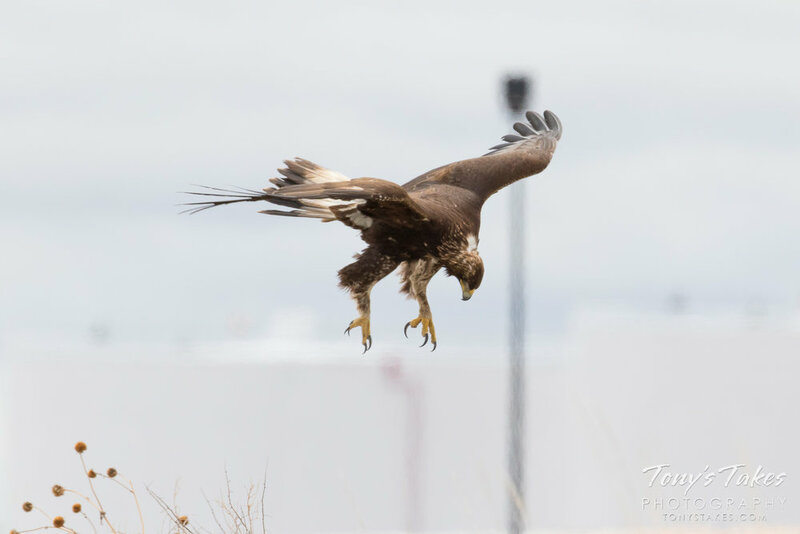 We will never forget our sighting of a golden eagle flying high over Teddy Roosevelt National Park carrying a prairie dog! In Wisconsin, during the winter golden eagles can feed on deer carcasses and hunt wild turkeys. The National Eagle Center in Wabesha, Minnesota conducts a golden eagle count in January in Wisconsin, Minnesota, and Iowa. They usually tally over 100 golden eagles in Wisconsin. Many goldens are found on prairie bluffs in Buffalo County. Many people think that our wintering population is from the western great plains and mountain states; however, eagle biologists with the use of transmitters have found that our overwintering golden eagle population summers in the high arctic in the Northwest Territories. We hope you will be lucky to find some birds at Goose Pond Sanctuary this spring that you will remember for years to come.